Published: Jan 12, 2016 · Modified: Sep 18, 2018 · By Jen Sobjack · This post may contain affiliate links. 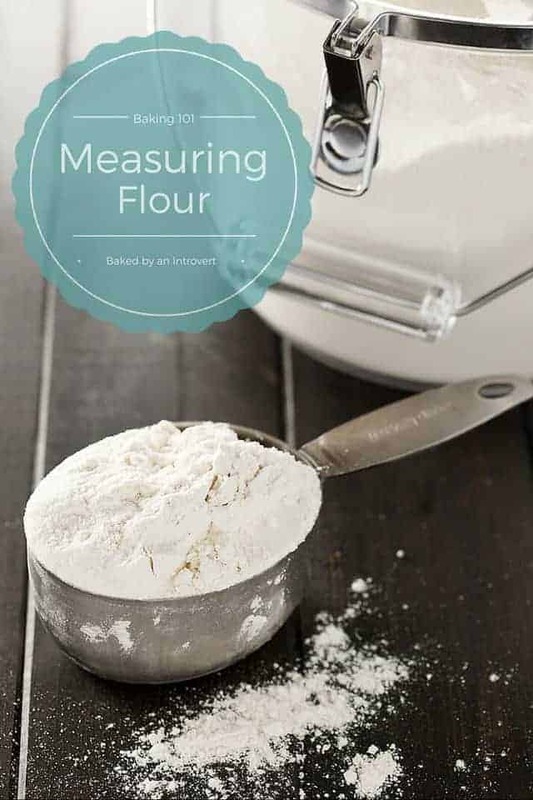 Understanding how to measure flour is an important step in baking. Learn how to measure flour the correct way so your recipes come out perfect every time! Have you ever had a recipe come out dense or dry? Chances are, you are using way too much flour in the recipe. This happens by not properly measuring the flour. Yes, there is a proper way to measure flour! This short post will explain why it is so important to use accurate measurements to achieve the best results with all of the recipes on Baked by an Introvert. Let me start by prefacing that different flours have different weights and you should always measure the flour the way the original recipe developer intended. The way that I measure my ingredients may not necessarily work for someone else’s recipe. This post is geared toward all the recipes on this site (Baked by an Introvert). I often get comments on my most popular recipe for basic vanilla cake on how the cake was too dense and dry. This can happen if you use too much flour in the recipe. Bread and cookies are also affected negatively when you don’t measure flour correctly. Bread will come out dense and heavy while cookies will crumble. Let’s focus on all-purpose flour since 95% of all my recipes call for this flour. It’s versatile and can be used in cookies, bread, cakes, brownies, pizza dough… just about anything. You can learn more about other types of flour in my flour basics post. When I measure all-purpose, I go off the assumption that 1 cup is equal to 130 grams. This is pretty standard, but as I stated above, it can vary with different types and brands of flour. 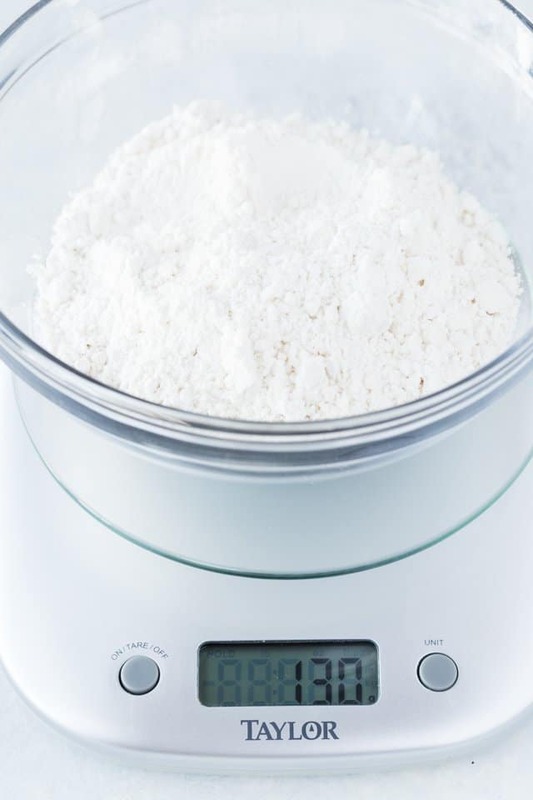 The most accurate way to measure flour is to weigh it with a small, inexpensive kitchen scale. You can get them for around $20. Place your bowl on the scale and zero it out before adding the flour. Now let’s say you don’t own a kitchen scale and the recipe calls for 1 cup of flour. How would you measure it? Most people will scoop the flour right out of the container with the measuring cup. I know some Food Network stars who do this. But this wrong! Here’s why. Flour compacts. 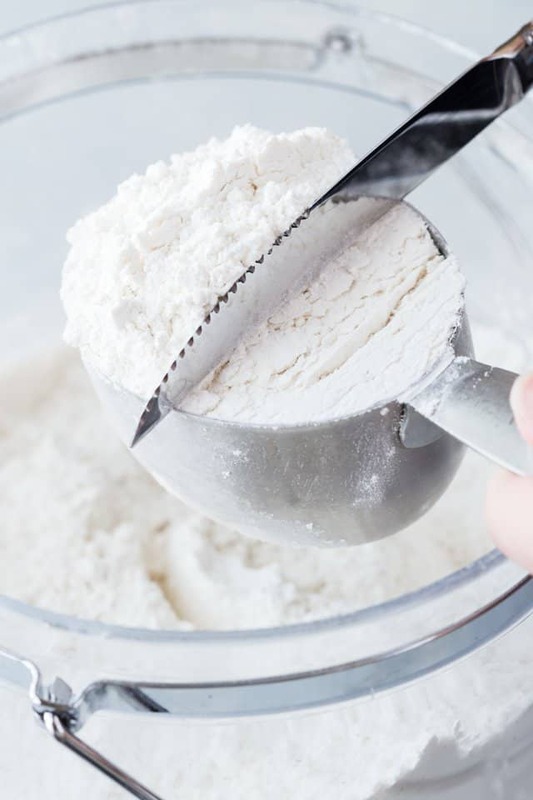 A 1-cup measuring cup can hold much more than 130 grams of flour. Remember, 130 grams is my standard cup. When I weighed the flour that was scooped out with the measuring cup, it was a staggering 155 grams. That’s 21 grams more flour than needed. And this can certainly lead to a dry, heavy baked good. 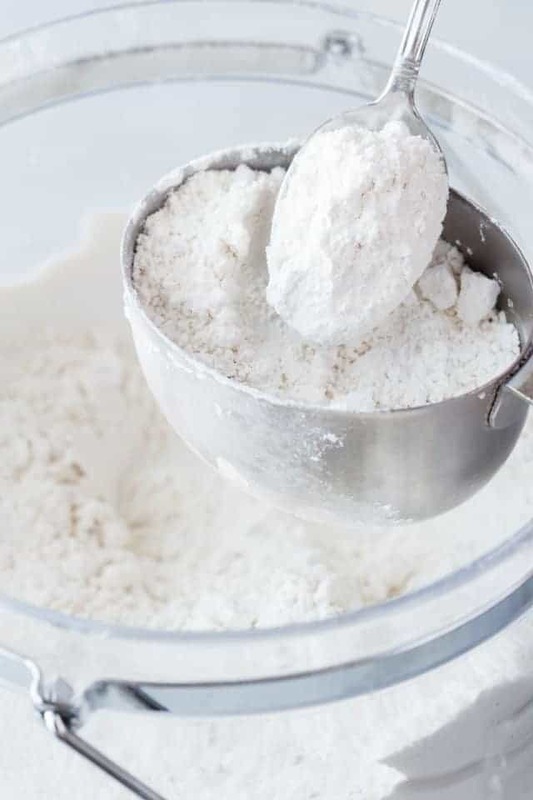 Use a fork or a spoon to lightly fluff the flour in the container. This will add a little air making the flour lighter. Then gently scoop some flour up with a spoon and sprinkle it lightly into the measuring until you have a mound of flour above the rim. Once the flour is piled high in the measuring cup, use the back of a knife to level off the top. Can you guess how much the flour weighs when it’s measured this way? 130 grams! And that is going to yield perfect recipe. I don’t always use a kitchen scale, but I do always fluff, spoon, and level the flour. Every single recipe on this site is developed using this method. I can promise you will end up with a successful recipe as long as you follow these steps for how to properly measure flour. Baking 101 – Baking should be creative and fun, not stressful. How to make the perfect cake – The days of dry, tasteless, failed cake recipes will be no more if you follow each of the tips I have laid out for you. Must have tools for every baker – From the type of pans I use to bake cakes to my most desired spatula, you want to know. One thing I took away from Home Ec (when high schools still had that) was that we were supposed to measure flour out the spoon and knife method. So, I did. In the past year or so, I just stopped doing it. I guess because I didn’t really know why I did that except that it was the way I was taught. Now I know why and I’ll go back to that method. Thank you! Proper technique is really so important when it comes to baking. Your recipes and excellent explanations are making me a better baker! Thank you! This is the most helpful explanation I’ve seen about how to measure flour. 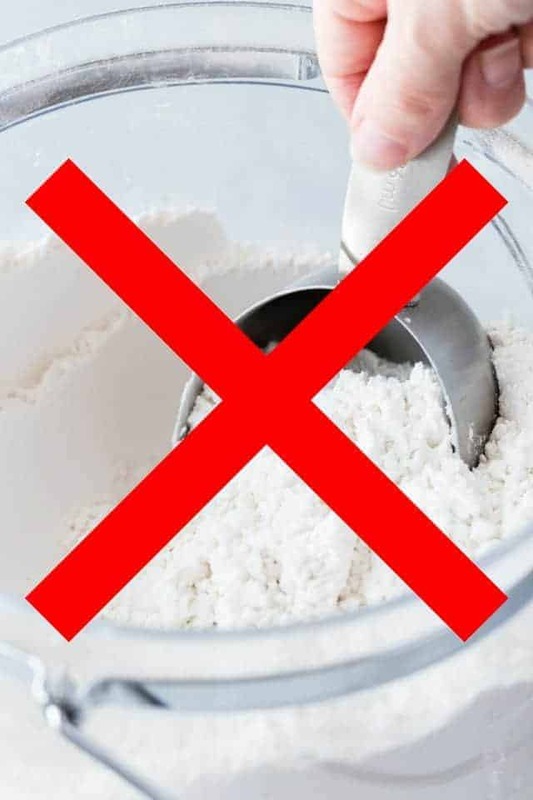 Question: when and why is it necessary to sift flour? It’s always a good idea to sift flour, especially for cakes and cupcakes. Sifting aerates the flour giving you a lighter texture. If a recipe calls for 1 cup sifted flour, measure the flour after it has been sifted. If it calls for 1 cup flour (sifted), measure the flour and then sift it. Great recipe, how did you get to your calorie count? I worked it out in my fitness pal and each brownie came in at 255 calories?? I’m not sure what brownie recipe you’re referring to but calorie counts should not be taken at face value. There are a lot of variables which can give different results from what’s listed on the recipe. The brand of ingredients you used and the size of your servings are just a couple examples that will cause varying calorie counts. My BF can’t have all-purpose flour. Your brownies look amazing, and I was all excited to share this recipe but then I noticed the all-purpose. Have you ever tried an alternative flour? Bob’s Red Mill has a gluten-free flour that works as an equal substitute for all-purpose. I’ve never tried it myself but I trust the brand enough to recommend it. It’s worth a shot! Hello, Can you tell me about how many ounces that is, as I have a kitchen scale that does not include metrics. Wow…as a very late baker, I am discourage because my cakes are dry and dense. I am hoping that by changing my methods of measuring it would make a difference. Any other advise would be most appreciative and helpful. This is so helpful! Baking is my weakness.. I hate measuring! I’m more of a “taste as you go” cook. Lately all my baking projects have been to dense- I’ll try this next time!! A valuable lesson and a great reminder for those of us who get a little lazy sometimes! Thanks Jen! This is very useful! I can bake the same cake 100x and more times than not I do not recreate the same cake…ever! This requires me to slow down lol! I’m so glad you find this helpful, Jackie! Happy Baking! This is so helpful! I have to admit, I rarely use my kitchen scale but I do try to fluff as I go! Great post! Very helpful, thanks Jen! yes, exactly how I measure my flour! 🙂 Great tutorial Jen! Wonderful tips! Before I started my blog, I always measured flour by scooping. When I started researching how to do things properly, this was one of the first things I discovered. I’ve been using the scoop-and-level method ever since! And it TOTALLY makes a difference! Fantastic post! I love seeing something like this, for all to review and learn from. We have been working in the kitchen (mostly baking) with our kids, and this is exactly the type of material that we go over with them throughout the process. Thanks for doing this one! I’ll never forget the day my mama taught me how to measure flour growing up. This tip is a total life saver!!! This is such good info, Jen! When I’m at school we ONLY use a scale to measure baking ingredients like flour—it’s amazing the difference it makes when you weigh it! This is such a great post, Jen! I know that I still measure flour the wrong way sometimes, or just don’t measure correctly out of laziness. I love the tips that you provided!